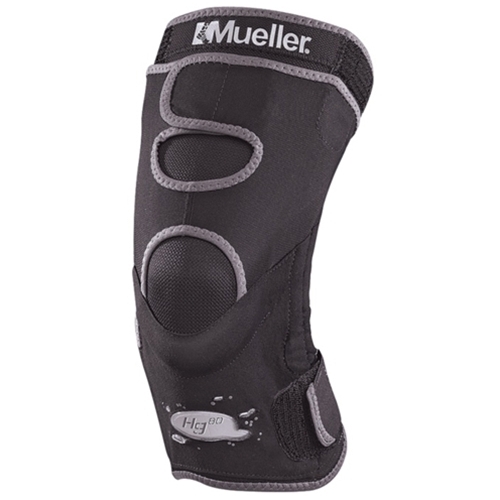 Mueller Hg80 Knee Brace from HealthyKin.com uses Mueller-exclusive HYDRACINN™ fabric, which is the moisture-wicking catalyst for maintaining superior support with heat management. Base sleeve is made of antimicrobial fabric that is uniquely breathable, extremely soft to the touch with flatlock seams, and features a conforming hourglass design. Inner grip strips complete the anti-sweat/non-slip design to help prevent brace migration and preserve high-performance support. This comfortable brace provides support for stiff, weak or unstable knees, as well as protection after injury. Anti-slip inner grip strips help prevent brace migration. Mueller-exclusive HYDRACINN™ fabric is a revolutionary moisture-wicking and neoprene-free material. Protective Nylon MESH LAUNDRY BAG comes custom-sized for every Hg80 brace to shield your clothing and other equipment in your gym bag or washing machine from hook & loop straps. The open weave design with locking cinch string allows for a thorough yet gentle cleaning.